We recently received a nice newsletter from our buddies at Castle Face Records telling us about a few exciting things they’ve got coming up and we figured it’d only be right to share. 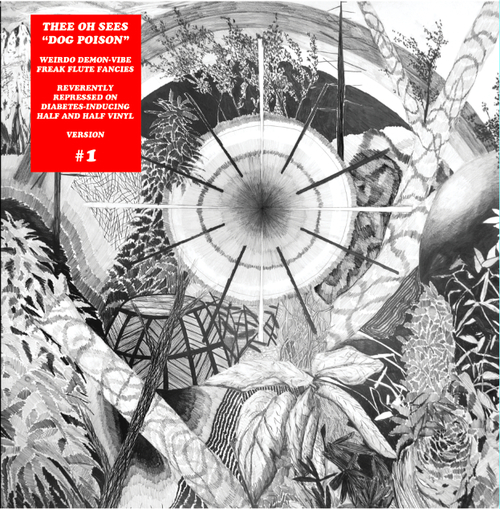 Looks like JPD and crew are now taking preoders for the reissue of Thee Oh Sees Dog Poison LP – originally released by Captured Tracks in 2009 [between Help! and Warm Slime] This time the LP is being offered in two limited editions: 222 copies on half-translucent blue/opaque red and 222 copies on half-translucent red/opaque blue. Sounds pretty. They also just announced the second part of their Groupflex series – SON OF FLEX – which will feature exclusive tracks from Thee Oh Sees, Warm Soda, Ty Segall, Mikal Cronin, Kelley Stoltz, White Fence, Sic Alps, Burnt Ones, The Mallard, and Blasted Canyons. If you snagged the first flexi book – then you know it’s definitely going to be something worth snagging. The artwork for this one is being compiled by Mr. Joe Roberts – you can check some of his work here. All this to say and bring up that Thee Oh Sees will also be in town later this month at The ZombieShop to help us celebrate our birthday on September 20th. Sweet.